After Delay, SpaceX Dragon Reaches Space Station : The Two-Way Mechanical difficulties after Friday's launch pushed back the capture of the unmanned capsule by a day. The Dragon will stay in place until the end of March, after dropping off 1,200 pounds of supplies, and return with more than twice that amount. The SpaceX Dragon cargo vehicle is grappled by the International Space Station's robotic arm Sunday morning. The Dragon has been captured. The SpaceX unmanned craft connected with the International Space Station at 5:31 a.m. ET, NASA tweeted. The spacecraft arrived a day late due to mechanical problems after Friday's launch from Cape Canaveral, Fla.
"As they say, it's not where you start, but where you finish that counts, and you guys really finished this one on the mark," space station commander Kevin Ford said, according to The Associated Press. NASA public affairs officer Trent Perrotto tells our Newscast Desk the Dragon's hatch should be opened Monday. "This Dragon spacecraft's delivering about 1,200 pounds of supplies that will continue to support space station research experiments," he says. The AP lists some of the items on board: "640 seeds of a flowering weed used for research, mouse stem cells, food and clothes for the six men on board the space station, trash bags, computer equipment, air purifiers, spacewalking tools and batteries." 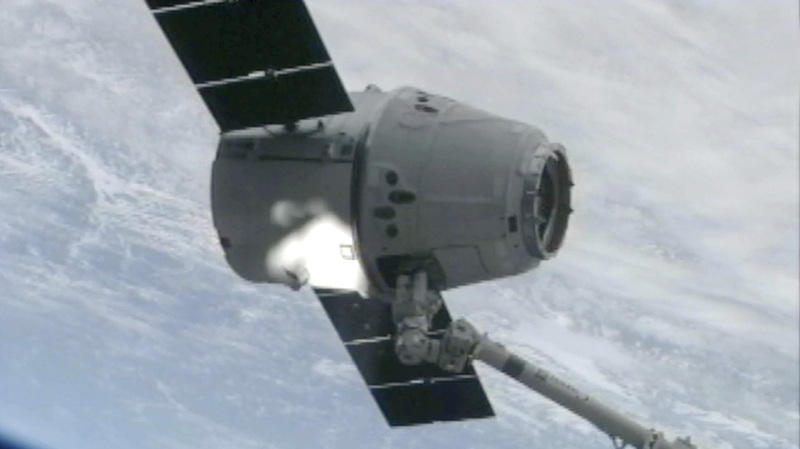 The Dragon will stay hitched to the space station until it returns at the end of March. At that point, NASA says, it will head back with more than 2,600 pounds of research samples and equipment. Friday night, SpaceX founder Elon Musk tweeted his appreciation to NASA. Just want to say thanks to @nasa for being the world's coolest customer. Looking forward to delivering the goods!